i've recently discovered an awesome new store, avenue 32. online based, it provides women's luxury designer items to the masses. i love finding out about new designers, although it makes my mental "when i win the lottery i will buy" list a whole lot longer. oh how i wish i was rich. now that i have found out about vivetta i cannot stop lusting after the new spring collection. the perfect balance of girlish and rock and roll aesthetics, it's as if it was made for me. 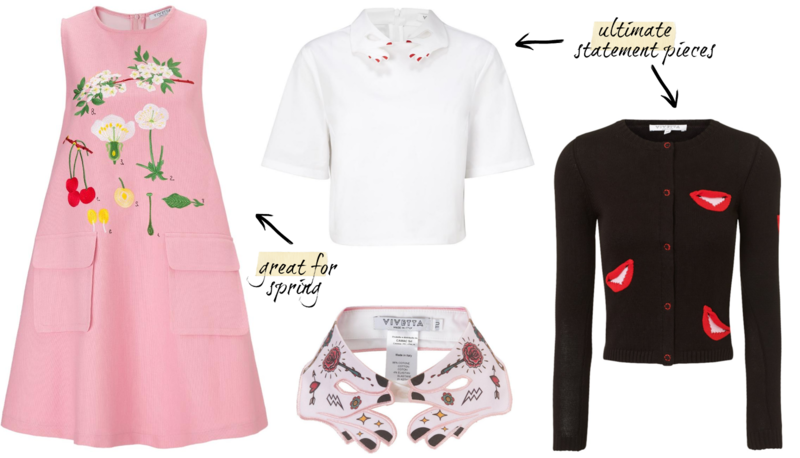 above are four of my top picks, especially the dress and the printed collar. even together they look amazing! i always prefer to wear feminine pieces in my looks, but to make it more statement-worthy it's great to add a quirky touch and vivetta seems to do just that. everything i love about fashion i think has been bundled into her collections. not only that it's similar to one of my already favourite designers, lulu guinness. PLUS, can you believe one of her close friends is alexa chung? that's when you know you've found a good'un. know for some it may be a little out there, but there's no harm in being brave with fashion in my opinion. at least you're standing out for all the good reasons. imagine how amazing the dress would be in spring with some pointed 'off-duty model' boots right? ugh, so good. now i just need to figure out how to get an extra £310 into my bank account so i can buy it. so what do you think? is this a style you would enjoy wearing? i'm definitely going to be taking inspiration in future looks i put together from her. let me know! next post - an outfit one! i'm getting better at maintaining them into my posts again. speak to you on saturday (when i'll be london based for the weekend!). All these look lovely and that dress is so my style and what a cute collar.